Listed in Sutton's 1934 catalog. A rarity with sky blue flowers in pairs that bloom from midsummer until frost. The parrot beak shaped blooms are one of the largest flowers of the salvia clan and are lovely massed in borders with mixed annuals and perennials. Depth: Surface sow or lightly cover. Starting Indoors: Start in vermiculite or other soilless mix 8 weeks before last frost. Keep at 65-75°F. Water only from the bottom by placing in a tray so that the water is soaked up, rather than wetting the tender seedlings, as they are susceptible to damping off. 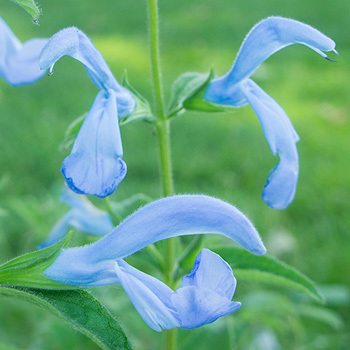 The large flower wands of salvia attract hummingbirds and other pollinators like few others. Place among other summer annuals in the front border or in containers. It develops tuberose roots that can be lifted and stored like dahlias. Watering Details: About 1" per week. Fertilizer: Do not overfertilize. Mix about 4" of compost into the soil prior to planting. If soil is especially poor, it may be beneficial to feed once a month with an organic water-soluble feed or granular fertilizer. Diseases & Pests: Prevent aphids and mites by hosing plants down when watering. If they become an issue, treat with neem oil or insecticidal soap. Mildew can be avoided with proper spacing and placement in a location that does not have poor air circulation. Plant: Bushy mounds of bright green, somewhat oblong foliage on green stems. Flowering: Spires of cobalt-blue tubular flowers. Seeds: Flowers turn into nutlets containing the small brown to black seeds. With about 700-900 species, Salvia is the largest genus of plants in Lamiaceae, the mint family.